This is a world of tranquillity, designed for sweet dreams and love on your Bali Honeymoon. The quiet charms of Sanur offer a romantic hideaway on idyllic #Bali. The Pavilions Bali, located on the Eastern side of South Bali, 30 minutes from the airport and only a stroll away from a stunning lagoon fringed by a reef, and a long white sand beach. 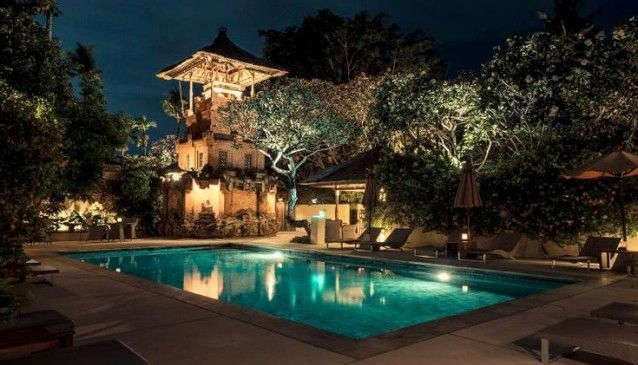 The 24 villas are designed to reflect traditional Balinese compound architecture. Pool villa (US$368 - US$393), Garden villas (US$243 - US$268), Honeymoon pool villas (US$412 - US$437), 2 bedroom pool villas (US$500 - US$537). Dine at the delightful authentic Jahe Restaurant. If you prefer the intimacy of your villa, The Pavilions has created some treats, from signature cocktails to candlelit dinners. Poolside Cafe and Bar: A relaxing place to share a cocktail as the sun sets or a leisurely lunch after a cooling dip. Within this peaceful compound, there is a jewel-like pool and cafe, business centre, library, gift shop, Spa and a delightful tropical restaurant.